If you have been following us for any length of time at all, you will already know that the Un-Chef doesn’t often follow recipes! Even when I come across one that I like, I usually read it, inwardly digest the basics and then make my own concoction. Generally, this will only work once you grasp the fundamental proportions and physics of the ingredients. In other words, you have to understand what makes a recipe hang together before you dare pick it apart, at least if you expect to have credible and edible results. The 9″ chocolate sponge cake was a problem right off the bat. I didn’t feel like having to bake a cake just to supply the base for this dessert. However, as far as I knew, you can’t just buy a basic cake without icings or fillings. It always pays to ask! On visiting the bakery dept. at our local Loblaws Superstore, I managed to cajole the manager into parting with one of his frozen bases, which would normally be used to make their own specialities. Strong brewed espresso coffee is a very rare commodity in our house. We do have an espresso maker in mothballs in the basement, but I had no intention of going rooting about for it. Instant coffee dissolved in hot water was our substitute. Marsala Wine was on hand, surprisingly enough, courtesy of our son Ian, but it was dry not sweet. In it went regardless. A little less sweet won’t harm anyone! Mascarpone cheese, even for 8oz was over $6. On the other hand, 1lb of lite cream cheese was $1.79. Although more like the consistency of Mascarpone than regular cream cheese, I still needed to blend it together with some sour cream to get even closer to the real thing. The real challenge came when I started assembling the ingredients. First, the ladyfingers were too tall and I had to cut each one to about 2/3 length. It looked like the tips would be wasted. Next, I found that there was not enough filling to reach even close to the top of the springform pan (or the ladyfingers). So, I arranged the remaining ladyfinger tips around the top of the cake and put it to set in the refridgerator. The next day, I whipped up additional whipping cream flavoured with Amaretto, glazed some fresh strawberries with melted fruit jelly (preserve not jello, I happened to have quince on hand), unmoulded and assembled it as pictured above. the proof of the pudding was indeed in the eating. By all accounts, my modifications had not detracted too much because comments were universally positive, especially from my wife Dorothy who is a critic I can always rely on to tell me the truth as well as being a true lover – of desserts. 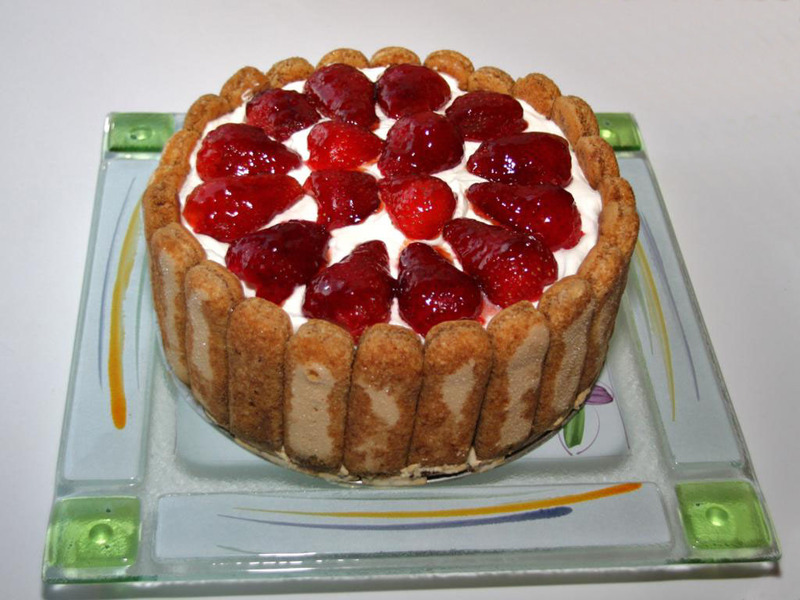 Click Here to Download Tiramisu recipe in pdf format.